On Saturday morning I received from Companies House the Certicifate of Incorporation for OpenStreetMap United Kingdom Community Interest Company Ltd. It is a private limited company, limited by guarantee. It’s taken us a year to get this far, through a protracted and often tedious process of agreeing Memorandum and Articles of Association,Community Interest Statement, form-filling, and signature gathering. Thankyou to everyone who participated, especially the volunteers who agreed to be the first directors necessary to get the thing off the ground. Now we can start doing the fun stuff of how we make this work and transform it into a living organisation. (Although I’m sure we’ll still have our share of bureaucratic process to navigate). 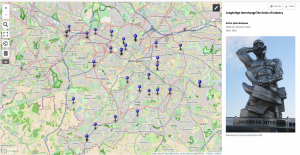 Mappa Mercia was at the 2 day Birmingham Highways Data Challenge hackathon last weekend where numerous datasets relating to highways and transport were made available. We won a prize for developing an HS2 HGV Traffic Heat Map. 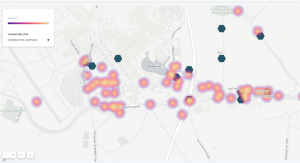 It’s not the finest visualisation, but we were up against a time constraint, poor initial data (essentially text descriptions of routes with no geolocation data) and having to learn new tools from scratch. A striking example of an entry that demonstrated shortcomings in the manner in which data is published by the organisation that some members of the team worked for, leading to them finding a fix for this which they will take back to their organisation; in this case HS2, with a recommended, enduring fix. Nothing like a bit of user testing to highlight improvements and a swift response by HS2 data managers to find a solution. 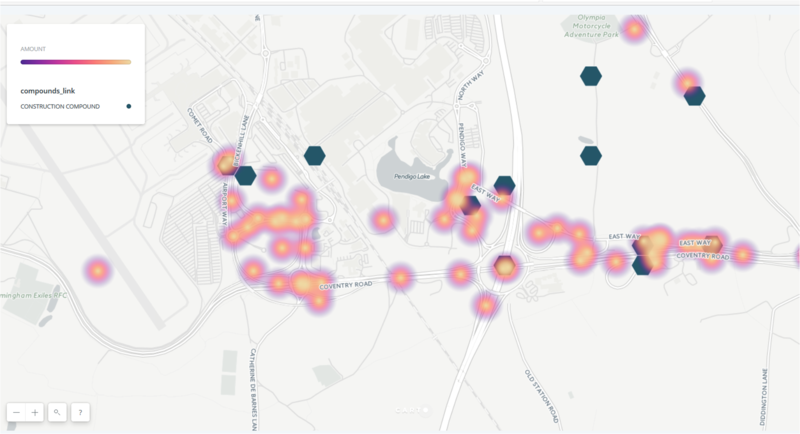 Traffic heat map showing anticipated HS2 HGV traffic intensity and flows – for the purpose of visualising the data the developers chose forecasted HGV traffic flows around Birmingham International Airport arising from the siting of HS2 construction compounds. Machine-readable extracts from published documents. GeoDatabase Files of HS2 Traffic Links and Compound Locations. 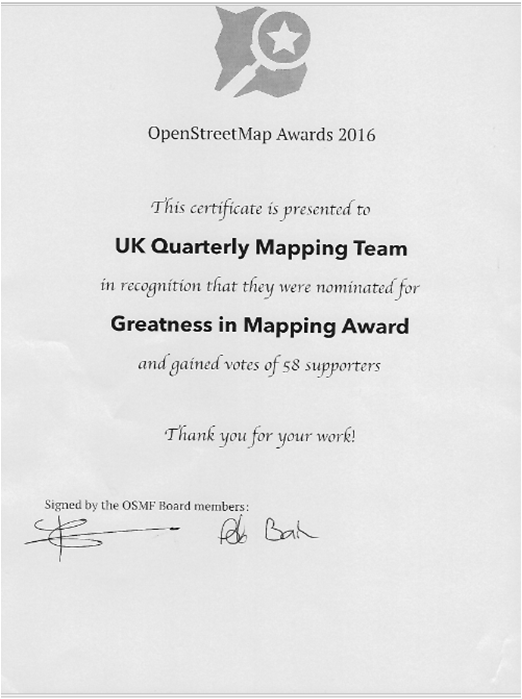 Congratulations to everyone who has participated in the various UK Quarterly Projects. 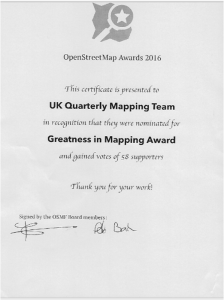 We were nominated for an award at the recent international State of the Map 2016 conference in Brussels. Unfortunately we weren’t awsome enough to win, but it’s nice to be recognised, even though that’s not why we do things. It’s just fun! Today saw us pass the 1,000 total for farmyards added during this project(1008 to be precise). Well done to everyone who has participated. What has been the most unusual farm name anyone has come across? Only a couple of weeks left – time to start thinking about our next quarterly project, while we see how many more farmyards we can add. August sees mappamercia celebrate its tenth birthday – can you believe it? We didn’t celebrate with a birthday cake but we did meet in Pershore Worcesteshire on Saturday 6th August at the Pickled Plum pub for lunch between morning and afternoon mapping sessions. It was a glorious English summer’s day and we got lots mapped. Why did we pick Pershore? Mainly because its postcode of WR10 nicely coincided with our birthday. Maybe we’ll be boxing around Worcester postcodes in August every year as we get older- see you next year in WR11! We had a good turnout of six people and took the opportunity of getting members’ signatures on the Memorandum of Assocation for OpenStreetMap UK Community Interest Company (this is one of the legal documents required to form a limited company). Yesterday I attended the Landor Future Highways Conference at the new iCentrum building on Birmingham Science Park, at the invitation of the Birmingham ODI (Open Data Institute) node. It was good to see so many OSM maps being used by presenters (thankyou Devon County Council and TransportAPI). I was provided an adhoc slot into the programme to deliver a lightning 5 minute presentation about OpenStreetMap (thankyou Birmingham ODI node). It was a bit daunting presenting to highway professionals, especially in front of a screen the size of an IMAX cinema! Then it was off to Leicester to train new volunteers in editing with iD, as part of Leicester City Council’s walking-mapping project which is an extension of their weekly Leicester health Walks. Thanks to Sara for organising the training and to Chris, Alan, Stan and AJ who took their first steps editing OpenStreetMap. We all look forward to you increasing the data coverage in Leicester. 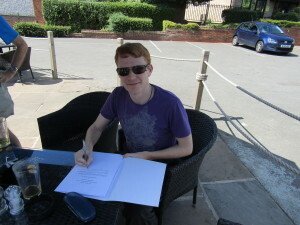 I’ve just about finished the edits from our June mini-mapping party in Kidderminster from 2 weeks ago, when guess what? Our July mini-mapping party is tonight in Tamworth – everyone welcome. We’ll be meeting in the Globe Inn Lower Gungate, Tamworth B79 7AT at 8pm. Dudley, in the heart of the Black Country in the West Midands, is not the sort of place you’d envisage a rural walk. The Black Country is so-named for its iron and coal and industrial might. Some have claimed the furnaces and mines of the Black Country were the basis for JRR Tolkien’s Mordor in Lord of the Rings. 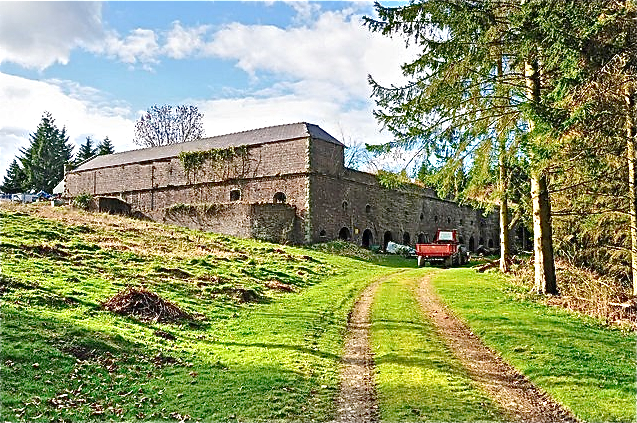 Most of the industry has now disappeared and left lots of brownfield sites, crumbling industrial buildings and a struggling economy, with its associated social problems. I have recently walked, surveyed and mapped the Limestone Walk. And what a delight it was! It was easy to forget the adjacent presence of a dense urban environment. The walk is poorly publicised and poorly mapped (the waymarking can be poor in places also). 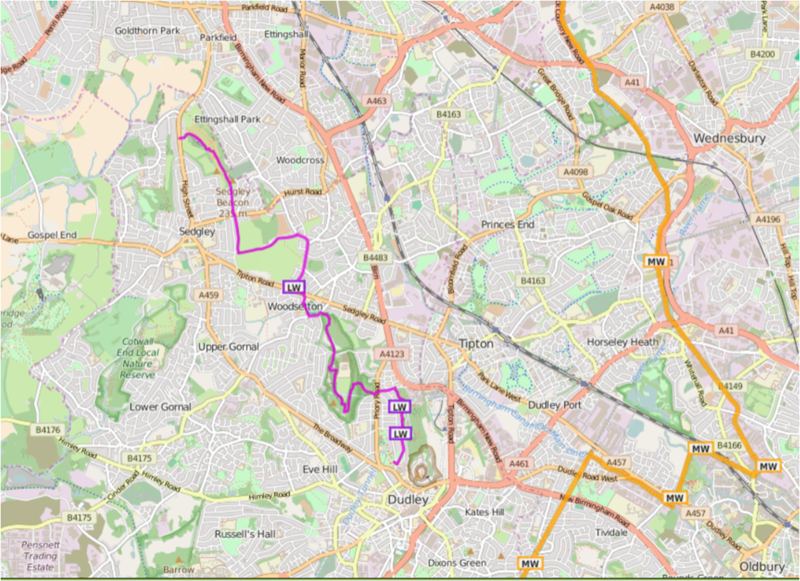 I could find little on the web which could act as a practical guide for anyone wanting to walk this route. The best I found was from the excellent Discovering Britain resource provided by the Royal Geographical Society. The walk commences at the ruins of Dudley’s mediaeval Priory and ascends Castle Hill (unfortunately Dudley Castle and its zoo are a paying attraction so the walk has to avoid them). Castle Hill is riddled with collapsed limestone mines and also with canal tunnels. A small diversion to the Black Country Living Museum is well worth the effort: it provides an extensive depiction of the industrial and social history of the Black Country. But the jewel in the crown of the walk has to be its passage through the Wren’s Nest National Nature Reserve. It has been a national nature reserve since 1956 and there is currently a bid to place it in wider regional GeoPark. It is world famous geologically for its well-preserved Silurian coral reef fossils and is one of the most diverse and abundant fossil site in the British Isles. It is also famous historically for here it was that the Scottish palaeontologist Sir Roderick Murchison studied the fossils and rock formations that led to him defining the Silurian System. The crater Murchison on the Moon and at least fifteen geographical locations on Earth are named after him. These include: Mount Murchison in the Mountaineer Range, Antarctica; Mount Murchison, just west of Squamish, British Columbia, Canada; tiny Murchison Island in the Queen Charlotte Islands in the same province; Murchison Falls (Uganda); and the Murchison River in Western Australia. The town of Murchison in the Tasman Region of New Zealand’s South Island was also named after him. It would be interesting to discover how many of these are mapped in OpenStreetMap. The walk culminates on Sedgley Hill. At 277m, reputedly the next highest point East is in the Ural Mountains. There are stunning views over much of the West Midlands, Staffordshire and Worcestershire; Birmingham’s city centre with its cluster of tall buildings can be seen in the distance squatting as it does on a low ridge. 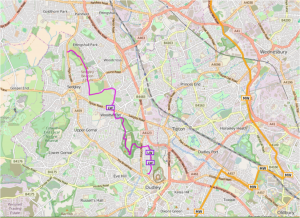 Dudly Council, under severe financial pressure, is doing it best to improve the infrastructure of the walk and to promote its use.I hope OpenStreetMap’s resource can be of use to them.